Feeding a family of seven can be tough, especially when five kids are involved. 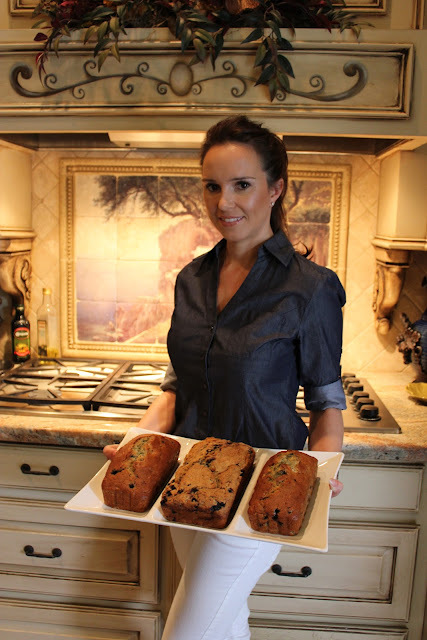 Fortunately for Chas, her entire family LOVES this banana blueberry bread. It’s quick, easy to make and simple to double or triple the recipe when you have lots of mouths to feed! “If you’re looking to lighten up this recipe, feel free to use a sugar substitute such as Splenda. The look may be slightly altered, but the taste is just as good,” says Chas. Enjoy! Chas presenting her banana blueberry bread. The loaf in the middle contains Splenda, so it looks a little different…BUT tastes just as good! 1. Position oven rack to the lowest rung. Heat oven to 350 degrees F. Grease bottoms of 2 (8×4-inch) loaf pans or 1 (9×5-inch) loaf pan. Or use aluminum so you can give them as gifts. 2. In a large bowl, combine sugar and butter. Stir in eggs until well mixed. Stir in bananas, buttermilk and vanilla and beat with a spoon until smooth. 3. Stir in flour, baking soda and salt just until moistened. Fold in blueberries. 4. Divide batter evenly between two 8-inch pans or all in the 9-inch pan. 5. Bake 8″ loaves for about an hour and 9″ loaf about 1 hour, 15 minutes, or until toothpick inserted in center comes out clean. Cool in pans on a wire rack for 10 minutes. One Response to "Banana Blueberry Bread"